Oh dear, the bikers in France are angry again! And when they are angry, they really mean it. Some 40,000+ motorcyclists are expected to take over the roads in France on 23rd October 2010 to cause complete chaos and misery everywhere in protest at the Government’s continued decision to ban lane splitting or traffic filtering. In France, you are expected to ride your motorcycle like you would drive a car, that is stay in lane behind each other and not overtake anyone in stationary traffic. So if you find yourself stuck in a massive traffic jam that could take hours to clear, then you must forget that you are on a bike and behave like if you were sitting in a car. Can you imagine yourself stuck in traffic in between a car in front and another behind although there is enough space around for you to filter through and move off? Well, if you break the law and filter through stationary traffic, you may find yourself with up to 4 points taken off your licence and a rather nasty fine to pay on the spot. They treat us like cars, we will behave like cars! The Fédération Française des Motards en Colère (FFMC – the French Federation of Angry Bikers) organised enormous protests nationwide back in March 2010 during which more than 40,000 motorcyclists brought France to a halt by invading the roads and the public transport (read our posts by clicking here and here). With the Government still refusing to make lane splitting or traffic filtering legal in France, the same motorcyclists will repeat their hugely disruptive actions on 23rd October 2010. “They want us to behave like cars so we will behave like cars and show the authorities how disruptive bikes can be when treated like cars” says one of the protestors who emailed us with details of the forthcoming protests. 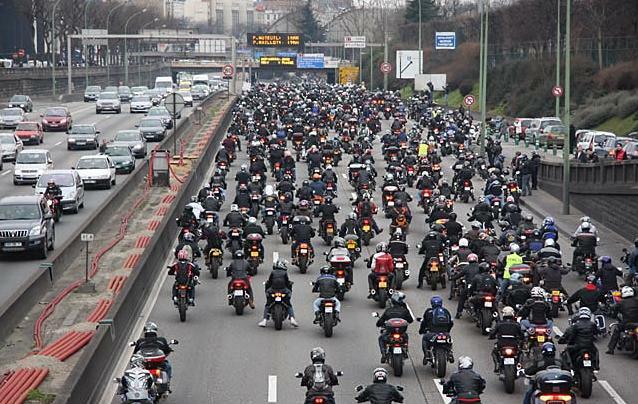 British bikers to ride en masse to Brussels! Meanwhile, British bikers, opposed to being stealth taxed to park by Westminster City Council in central London, will be getting prepared to ride en masse to the EU Commissioners’ Office in Brussels on 28th October 2010 to officially submit a demand that an investigation be immediately launched against the British Government into the violations of EU Directives by Westminster City Council (and others) when they allowed a brand new entity called NCP Services Ltd to perform the Parking Enforcement Contracts vacated by National Car Parks Ltd in March 2007 when the contract should have been re-tendered, in accordance with European law. This will mark an historic event whereby the British motorcycling community is taking the initiative to expose abuses perpetrated by a local authority that has dared to treat bikers like cash cows while potentially breaking the law (for more details, click here). We are told that a large contingent of French bikers will greet their British cousins upon arrival on the continent and ride all together to Brussels to meet with the EU Commissioners, as a united community. So here we go, it’s always best not to annoy the bikers and leave them alone, as they will always be prepared to fight back until they get what they want. They will never give up, they will always stand up for their rights and protect the future of their community from blatant, vile and unjustified attacks. oops. Three years motorcycling in France and now I find out lane sharing/filtering isn’t legal? Certainly isn’t observed very well, not in the SW anyway! And I’m sure I’ve ‘filtered’ past a gendarme before now without a problem. Am writing this from Canada where it is, and always think how daft it looks to be sitting there in traffic with gaps the size of small cars between traffic lanes. Vive les motards! Too bad I can’t be there to join in on the 23rd.